The yellow golden pheasant or Chinese pheasant (Chrysolophus pictus) is a gamebird of the order Galliformes (gallinaceous birds) and the family Phasianidae (pheasants). It has a pale brown tail with darker tan spots, and brown, rather than blue on its wings. The female is a pale golden with dark brown barring. Yellow Golden Pheasants are natives of the central, mountainous region of China. That is only true insofar as they are a color mutation of Red Goldens, which are indeed, from China. The adult male is 90–105 cm in length, its tail accounting for two-thirds of the total length. It is unmistakable with its golden crest and rump and bright red body. The deep orange "cape" can be spread in display, appearing as an alternating black and orange fan that covers all of the face except its bright yellow eye with a pinpoint black pupil. Both males and females have yellow legs and yellow bills. They feed on the ground on grain, leaves and invertebrates, but they roost in trees at night. While they can fly clumsily in short bursts, they prefer to run and spend most of their time on the ground. If startled, they can suddenly burst upwards at great speed and with a distinctive wing sound. 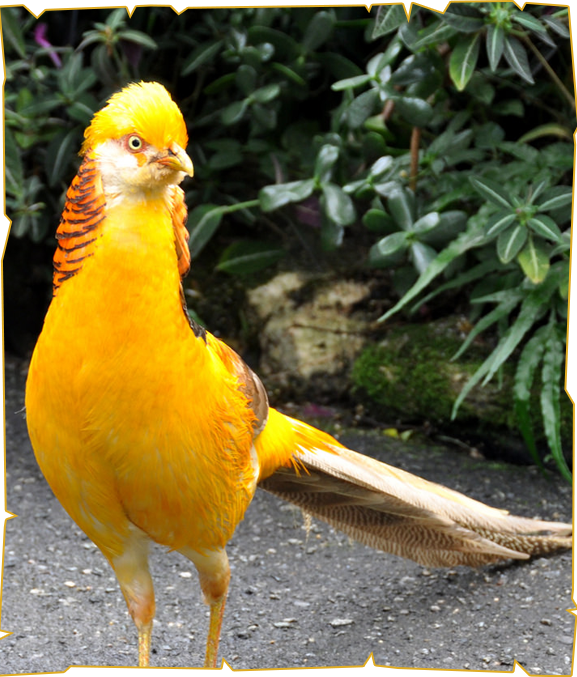 Golden pheasants lay 8-12 eggs at a time and will then incubate these for around 22–23 days. They tend to eat berries, grubs, seeds and other types of vegetation.